PinkyPiggu: Oriole Coffee + Bar @ Capitol Piazza ~ 1-For-1 Lunch Specials! What A Good Deal! From the Oriole's classics selection, we made choices of Fish & Chips ($20) and Capellini Crabmeat ($26). The lunch special also include other items such as Beef Cheek Tagliatelle ($22), B.L.T. Sandwich ($16), and Warm Spinach Salad ($18) with portobello confit, serrana jamon, poached egg and shaved black truffles! There was an initial worry that it will be a long wait as our friend who went to place order at the counter told us, "aiyoh the person in front of me ordered for a village!". Haha he's exaggerating a little of course, but thankfully our food arrived sooner than expected. The deep-fried snapper fillet looked promising with its light golden tan, but its texture was a tad dry for our liking. Faring much better was the capellini. Cooked to lovely al-dente bite, the pasta dish satisfied with its slightly spicy aglio olio flavors and generous chunks of crabmeat. My cup of Latte ($5.50) provided an enjoyable caffeine fix. Those who prefer cold-brews might want to try Oriole's series of ice coffee named Taisho. Available in Black ($6), White ($7), as well as M.A.D. Milk ($8) which is a diary-free nut milk made with macadamias, almonds and dates. 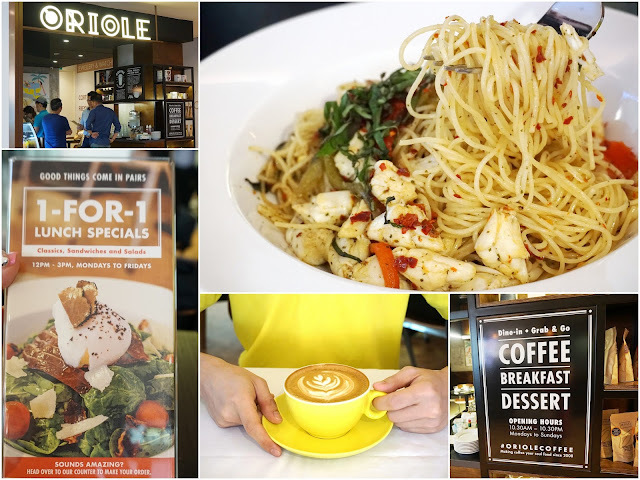 Its ambience might not be the best for a café chillaxing experience, but if I'm in the city hall area and looking for a good lunch deal with reasonably good quality, I will hop over to Oriole. Ahh, and must have a cup of their coffee too, definitely.